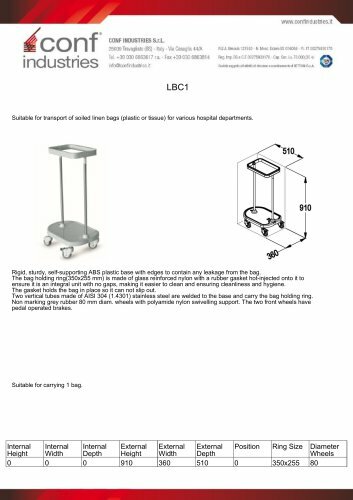 Suitable for transport of soiled linen bags (plastic or tissue) for various hospital departments. Rigid, sturdy, self-supporting ABS plastic base with edges to contain any leakage from the bag. The bag holding ring(350x255 mm) is made of glass reinforced nylon with a rubber gasket hot-injected onto it to ensure it is an integral unit with no gaps, making it easier to clean and ensuring cleanliness and hygiene. The gasket holds the bag in place so it can not slip out. Two vertical tubes made of AISI 304 (1.4301) stainless steel are welded to the base and carry the bag holding ring. Non marking grey rubber 80 mm diam. wheels with polyamide nylon swivelling support. The two front wheels have pedal operated brakes.